The truth is finally out there, or is a new deception is on the cards? The Pentagon admitted it ran a secret UFO investigation programme for five years until 2012. Luis Elizondo, who was the head of the Advanced Threat Identification Programme (AATIP), a US program set up to investigate reports of unidentified flying objects, UFO's, has declared the existence of unidentified flying objects using technology more advanced than human capabilities has been proved “beyond a reasonable doubt”. So...There it is a disclosure of sorts. According to the Department of Defence (DoD), AATIP which was terminated in 2012, produced documents that described sightings of aircraft travelling at extremely high speeds with no visible signs of propulsion. The Pentagon has also revealed that they recovered metal alloys from a UFO that they do not recognize. The materials are said to have properties that are amazing and are currently said to be in storage in buildings in Las Vegas that have been modified. The Department of Defence did not have any idea as to what the materials are as it was a compound that is unknown to them. William Brazel contacted the military of his find. 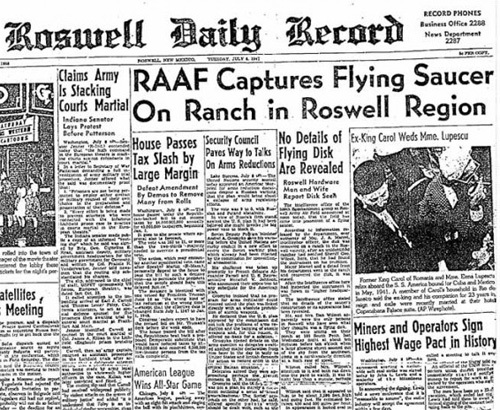 The United States Armed Forces then released a press statement to the Roswell Daily Record claiming they had recovered a flying saucer on a ranch in the Roswell area only to claim in another press release later that day the RAAF personnel had recovered a weather balloon. A press conference was held, featuring debris (foil, rubber and wood) said to be from the crashed object, which seemed to confirm its description as a weather balloon. 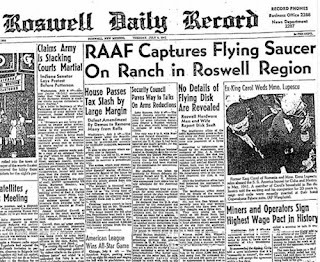 After 70 years of denial and deception, the US finally confirm the existence of unidentified flying objects, ufos, what will be the next big DECEPTION? 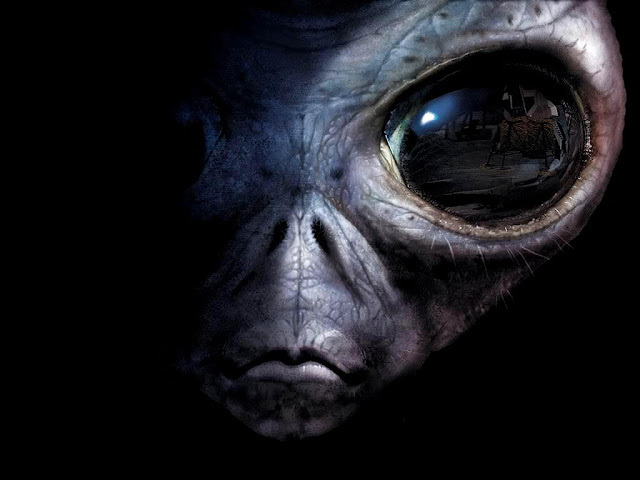 Will we be told these entities are not interplanetary but interdimensional and are demonic rather than a friendly super intelligent friend who has flown here to help our species evolve? Definitely not, 2018 promises to be a very interesting year, the evil is out there. They've been here quite a while now. They hate mankind and parasitize them. You know who they are.. Remember the feet on the image described by Daniel? Aliens are demonic entities,not men from space.This is the great delusion God sends upon the earth. They are demonic, but not from space. They are illusions made up by man himself, influenced by demons. The governments have the ability to do this. Why? So they can put fear into you and control you. Yes, something is coming. But is not from aliens, although the powers that be want you to believe that. When the fake attack comes look for the whole world to come together to fight it. Through the U.N. of course. U.N. vehicles will be all over your streets, curfews, the works. Along with Agenda 21 this should work to perfection to herd the masses into U.N. controlled camps of safety. These so called aliens are fallen angels. The only things that stops abduction is calling out Jesus's name. Your spot on Cary - nothing new under the sun, many will be duped again by believing all this demonia is extraterrestrial & w/out any doubt the chaotic pandemonium will run wiled until that fellow of perdition will sooth their souls! My first assignment in the Air Force was missile security. We has a strike team respond to an electronic security alarm on a site, and when the team got close, they saw a large, cigar-shaped object slowly move off from over a Minuteman site, After that, we had to have people from Lockheed Martin come out and put the missile back on alert status. Another instance is when I was in the Presidential Honor Guard. One of the men said that he had been a guard in a hangar for a saucer-shaped object that had been brought in from a crash site. This was in the late 60's. I wish people could give evidence instead of claiming to have and understand the word of God. I studied the Bible for 30 years and believe there is massive evidence for ET and if ET wanted to destroy us he would have done so by now.obviously the ETs hovering disproportionately over nuclear silos have good intention so it seems like ignorant bible thumping to me to label all ET's as demons. That is so ignorant it is not even worth a response. If you do the research just google ufo jesus pictures in art and you will see that Jesus is associated with UFO's throughout his life in artwork all over the planet that is hundreds of years old. Jehovah needed a ufo to hover around in as a pillar of fire by night and a cloud by day for forty years in the wilderness. Ascension equal tractor beam?virgin birth equal abduction and implantation? Jesus a hybrid? Well, there is lots of evidence thousands of people claim they have been abducted against their will by these monsters, evidence of cattle mutilations, I have also studied the Bible and it actually warns us of them. Ephesians 6:12 jumps to mind-For our struggle is not against flesh and blood, but against the rulers, against the authorities, against the powers of this dark world and against the spiritual forces of evil in the heavenly realms. There is evidence that there are evil ET's and evidence that there are good ET's. We have people fighting that all ET's are evil with evidence as well as people with evidence who believe in good ET's. If we come together to the middle of this argument it is clear that there are both kinds. 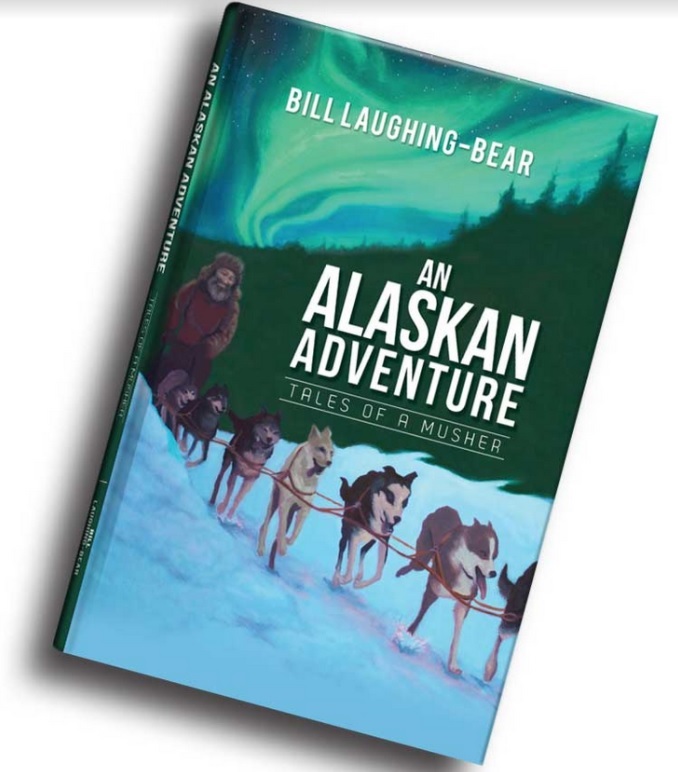 "The truth is finally out there, or is a new deception is on the cards?" It's a deception. Look for another 'war of the worlds' event. Hologram of saucer over LA? Lasers from the 'saucer' taking out large bldgs. in the cities? Don't doubt it. If they can do it (they can), they will do it. Standby for fakery.